Your first real job. Buying a house. Marriage. Kids (or so I hear). Making a will. Burying a parent. .....and now buying your remaining parent a mobility scooter / chair, is on the list. Yesterday, I took my mother to a medical supply store to check the out. At her "independent" living complex, she has not been so independent. With being on oxygen, those portable canisters are pretty heavy - 8lbs. That's a 10th of her weight. 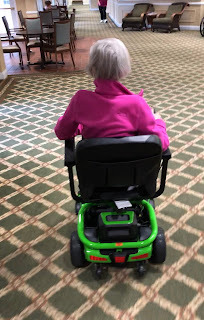 So an aide has had to take her by wheelchair to and from the dining area. She can walk, but for limited periods of time and distance. So to help gain some additional freedom, one of my sisters invested time to get her a concentrator that is only 2lbs and doesn't need refilling. My "job" was to look at scooters. The place she's at - everyone has them. Four or three wheeled transport. Red seems to be the colour of choice. Those are nice, but the baskets on them are fairly useless. They take up some amount of room and don't roll under a table. My mom liked the chair versions. Easy get on and off. But it drives with a joystick. As she's isn't proficient in Grand Theft Auto or Myst, this would be new to her. As it turns out, she did really well around the showroom. We tried out a few. My mother - being my mother - was immediately drawn to the cheapest one. It was a new, but discontinued model, hence the $500 markdown. It would have been fine actually. The newer version had better wheels, a better seat (allegedly) and could be taken apart into more pieces for transportation. And it is more expensive.......and it came in Envy Green. She liked the upper model but with the cheaper one's seat. And in a matter of minutes (plus the first hour), we were signing the receipt and loading it into my car. Sure they could deliver this upcoming week, but if it could fit in a car, why would I deny her any more time to be stuck in a chair like Baby Jane? 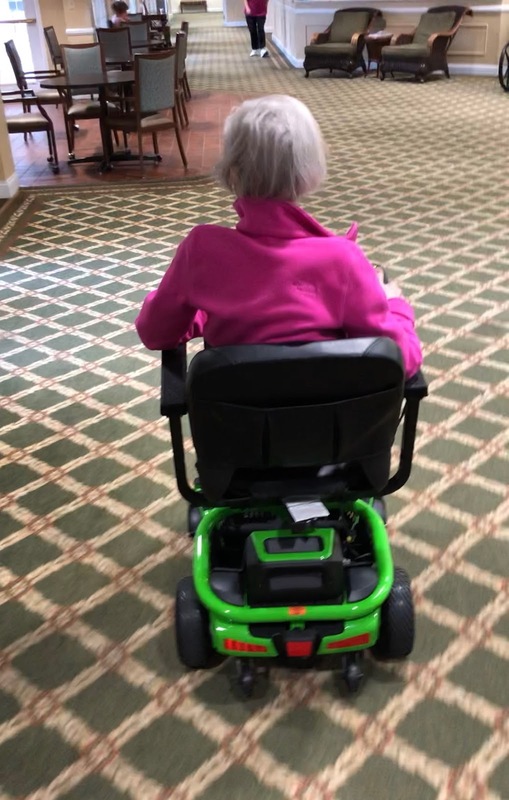 After a nice lunch out, I had her back in the lobby of her place while I unloaded the scooter and drove it in from outside. What was great that a man who was in the lobby goes, "you got new wheels!. you're going to love them!". That made my mom feel great. I laughed (inside) because either after almost two weeks, they know who she is or it was a wild guess. I'm guessing this is like Senior Peyton Place. Everyone talks about everyone. Still, she was thrilled to be able to go down to the laundry room, the library, 4p happy hour, dinner - all without anyone taking her. ....and before you ask, yes, I made sure she could get in and out of the door and made her plug it in (and unplug it) to make sure she could do that too. So, we will see what this week brings. But I suspect she might like this place a little more now that she can get out of her room whenever she damn well pleases. cool ride! hope she enjoys scooting around to the places she wants to go. Bravo! It will empower her to live to the fullest. At a time when she might be feeling like she's losing a little of both. Good on you and your family. there is a some bittersweet in buying a scooter; you did a fine job capturing it.